Important factor for roots pump selection- Vacuum Pump - EVP Vacuum Solution! Roots pump has been always used as the main pump in vacuum system for its large capacity and stable performance. While in roots pump selection process, its capacity, ultimate vacuum, and pressure difference has been put high attention, but one of its important characteristics– the compression ratio on free flow state– have been ingnored. What’s the compression ratio on free flow state ? It’s the max compression ratio between pressure of suction port and that of discharge port when roots pump’s suction port is blocked and air flow at suction port is zero. When roots pump’s suction port is blocked, there should be no air entering pump. Than the roots pumpcould achieve an absolute vacuum at its suction port, that is to say pressure disappeared here. But in real working environment, this situation is absolutely impossible. 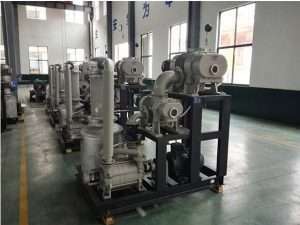 Because roots factors, such as backflow, air leak, etc, are inevitable, which is decided by the roots pmp’s trait, manufacturing process and design. Herewith, even if its suction tube is blocked, the roots pump’s port should exist pressure. The airflow free compression ratio reflects a ratio relation between its capacity and volume of airflow and leakage, equaling to its suction capacity. The bigger the airflow free compression ratio is, the less the leakage and backflow is. In reverse, the pump has big leakage and backflow if its compression ratio is small. 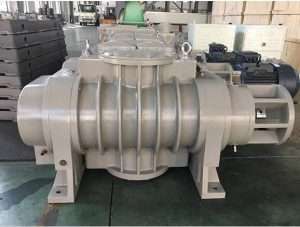 The air leak rate and backflow rate reflects the capability of a manufacturer on its mould lines design, gap control between rotor and pump chamber, processing & assembling, etc. An outstanding mould lines design and minimized gap between rotor and pump chamber enable smallest backflow volume. Sutiable material for rotor can lower the impact of thermal expansion. Whilst, flat rotor surface can decrease the absorption of corrsive material. Hence we can conclude the compression ratio of zero airflow can reflects the capability of manufacturer. In roots pump selection, except for the ultimate pressure and pressure difference, its compression ration of zero airflow should be non-ignorable factor.